Cranberries and maple syrup are traditional foods of New England that seem especially appropriate during cool months. Dried cranberries are more intensely flavored than their fresh counterparts and are available at specialty foods stores and some supermarkets. Preheat oven to 400 degrees F (200 C). 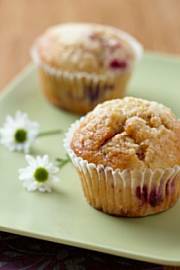 Lightly grease twelve 2 1/2-inch muffin cups or line with paper baking cups; set aside. In a medium mixing bowl stir together flour, baking powder, baking soda, and salt. Make a well in the center. In a small mixing bowl combine egg, maple-flavored syrup, milk, and melted butter or margarine. Add all at once to flour mixture; stir just till moistened. (The batter will be lumpy.) Fold in dried cranberries or cherries, raisins, or chopped fresh cranberries. Spoon into the prepared muffin cups, filling each two-thirds full. Bake in a preheated 400 degree F (200 C) oven about 20 minutes, or till golden brown. Transfer muffins to a wire rack. In a small mixing bowl combine confectioners' sugar, 1/4 teaspoon maple flavoring or vanilla, and enough milk to make a smooth icing of drizzling consistency. Drizzle over muffins. Just made some of these, i baked the first batch at 160 degrees for 25 minutes and they turned out better than the second batch that i baked at 200 degrees for 20 minutes. accidentally added a bit of nutmeg but still turned out pretty yummy. Diana, I Love Your Website and have made so many of your recipes with excellent results. This afternoon I made these muffins with the Maple Syrup we purchased in New Hampshire. These were Yummy!! Can I use the same recipe to make a quick bread also if I lower the temp and cook a little longer? A bit on the dry side. And I followed the recipe to a tee, opting for the dried cranberries.